Note: This is a classic, circa 2012, CrossFit original workout. Advanced Athletes are encouraged to use the Ring Dip skill and perform Chest to Bar Pull-ups. The Handstand Push-up will also be a “scale up” modification. Ben is Athlete Of The Week! Congratulations to Ben who was recognized as Athlete Of The Week at CrossFit Amundson. Ben is a perfect example of the true “Warrior Athlete” who uses his incredible level of physical conditioning to be of service to his community. Ben serves as a Firefighter in Hayward, CA., in one of the most respected Fire Departments in the Bay Area. When Ben steps foot inside the gym, you know it’s going to be a battle. Ben still holds the gym record for an amazing 6:02 “Big Loop” while wearing a 20lb. Weight Vest. 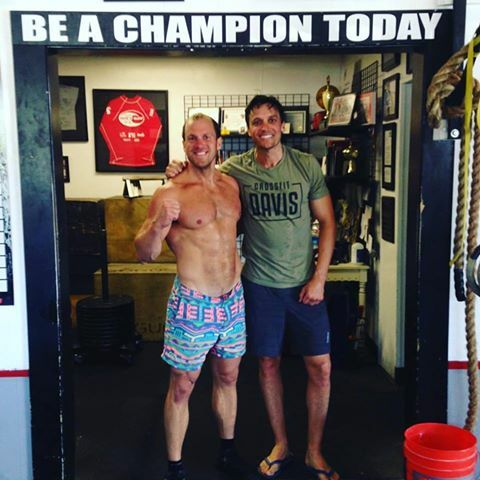 In addition to his physical capacity within the gym, Ben is also a big advocate for “Fitness Outside the Box” with sports such as swimming, surfing, hiking, and skateboarding! Thank you for your service Ben, and congratulations on all your success, both inside and outside the gym!